When it comes to meal planning, people with diabetes should focus on the quality and quantity of the carbohydrates they consume. In fact, the American Diabetes Association suggests that individuals with diabetes should be encouraged to replace refined carbohydrates and added sugars with whole grains, legumes, vegetables, and fruits. Sometimes, though, certain foods and beverages call for sugar. Replacing added sugars with sugar substitutes can help to increase weight loss and reduce blood sugars, however, there is a drawback. Most sugar substitutes, otherwise known as non-nutritive sweeteners, contain artificial ingredients. If you are looking to avoid artificial ingredients you can try a natural sweetener, but they aren't always healthier either. That's why it's important to be an informed consumer, weigh the pros and cons, and always practice portion control. Some natural alternatives to refined white table sugar still have as many or more carbohydrates than table sugar as well as a high glycemic index. Sweeteners like honey, corn syrup, brown sugar, and maple syrup can make your blood sugar spike and cause you to gain weight if eaten in excess. But, there are a few natural sweeteners you can try if they fit your dietary needs. Agave nectar comes from the Agave plant. It has been used for centuries as a sweetener, especially by the Aztecs. The nectar tastes sweet and has a consistency similar to honey. Agave is a popular natural sweetener because it is believed to have a lower glycemic index (GI) than table sugar or honey. The glycemic index of agave nectar is around 20 to 30, while regular sugar has a GI of 60 to 65. Foods that have a lower glycemic index tend to raise blood sugars at a slower pace. As we know, when it comes to diabetes, everyone is different so it's best to see how your blood sugar responds before making the replacement. As for the nutritional, when compared to sugar, one tablespoon of agave nectar contains about 60 calories and 16 grams of sugar. The same amount of granulated sugar contains about 45 calories and 12 grams of sugar. Therefore, using agave as a replacement for sugar won't necessarily save you calories. But you should use less because agave tends to taste sweeter than sugar. For example, if you replaced one tablespoon of sugar with one teaspoon of agave, you'd save 30 calories and 8 grams of sugar. Keep in mind also that agave is 90% fructose. When fructose is metabolized, most of it moves to the liver instead of the bloodstream, where it could raise blood sugar. But, while it may not raise blood sugars as quickly, increased intake can elevate triglycerides, a type of fat in your blood that is associated with an increased risk of diabetes, metabolic syndrome, and heart disease. Therefore, if you already have high triglycerides or other risks of heart disease (which many people with type 2 diabetes do), it is probably wise to use agave sparingly. Stevia is another plant that has been used since early times as a sweet source. It grows in South America, and the leaves are similar in shape to the mint family. The stevia that you purchase at the store is steviol glycosides-rebaudioside A and stevioside, which is extracted from leaves of the plant Stevia rebaudiana Bertoni. Because Stevia is 200-300 times sweeter than sugar, it takes very little to make things sweet. This automatically cuts calories and carbohydrates. One packet of stevia has 0 calories and 1 g of carbohydrate. 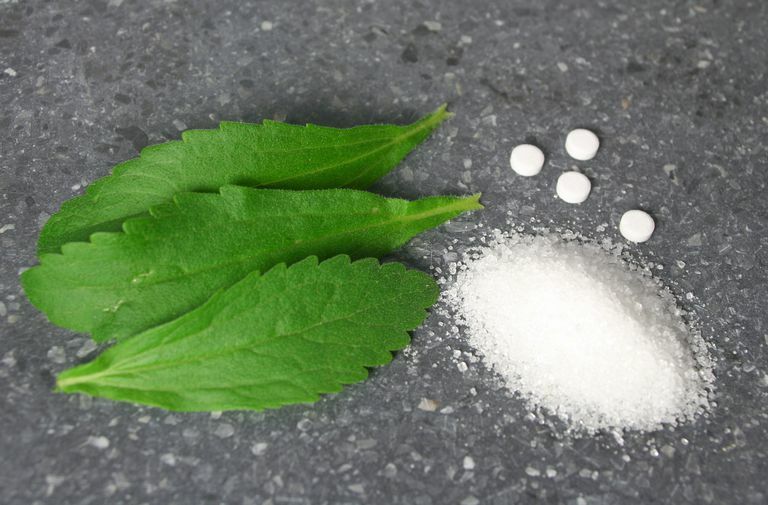 In a position paper, the Academy of Nutrition and Dietetics summarized five randomized control trials examining the effects of stevia compared with placebos on blood glucose, insulin levels, hypertension, and body weight. Studies reported minimal to no effects on blood glucose, insulin levels, hypertension, and body weight. In one study showing minimal effects, subjects with type 2 diabetes reported reduced postprandial (after meal) blood glucose and glucagon response after a test meal of stevia versus placebo. Monk fruit extract, also known as, Luo han guo, Siraitia grosvenorii, or Swingle fruit extract, is a combination of several different cucurbitane glycosides, known as mogrosides. It is extracted from a plant native to Southern China. Monk fruit extract is estimated to be about 150 to 300 times sweeter than regular table sugar and is reported to have an aftertaste at high levels. One 0.8-gram packet of Monk Fruit In the Raw contains less than 1 gram of carbohydrate and 0 calories, making it a good alternative for higher calorie, higher carbohydrate options. The issue with monk fruit extract is two-fold. Because it is hard to make, it can be expensive. In addition, although the FDA has deemed it to be Generally Recognized as Safe (GRAS), there are limited studies examining the long-term effects which mean there is no established Acceptable Daily Intake (ADI). If you are looking to lose weight or reduce your blood sugars than you'll need to cut calories and carbohydrates. Swapping refined carbohydrates such as sugar with non-nutritive sweeteners can assist in reaching your weight and blood sugar goals, however, these products contain artificial ingredients. There are some more natural alternative sweeteners on the market, but before switching, decide which one is best for you. Always take into consideration that portion control matters. Academy of Nutrition and Dietetics. Position of the academy of nutrition and dietetics: use of nutritive and nonnutritive sweeteners. J Acad Nutr Diet. 2012;112:739-758. Food and Drug Administration. Additional information about high-intensity sweeteners permitted for use in food in the united states.